Food choices and the impact of these on health and wellbeing is a socio-scientific issue for which young people have the power to act upon. FoodSwitch is a downloadable smartphone app designed to support people to make healthier food choices. FoodSwitch creates a great opportunity for learning that links to current scientific research, and offers young people the opportunity to develop and use scientific and health literacy capabilities. FoodSwitch is a downloadable smartphone app (Android and Apple) designed to help people make healthier food choices. FoodSwitch has been designed to assist people to make better food choices, and to enable public health researchers to find out more about how different types of front of pack food labels affect our food choices. FoodSwitch is a partnership between the National Institute for Health Innovation (NIHI), The George Institute for Global Health, and Bupa New Zealand. 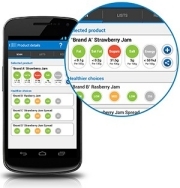 FoodSwitch is designed to help people to find out what is in the food they are eating. By providing easy to access information, the FoodSwitch designers hope that people will switch to healthier options. Visit the FoodSwitch website to find out more. The STARLIGHT study is using the FoodSwitch app to find out what effect different types of front-of-pack nutritional labels have on food choices. Each participant in the study will be encouraged to download and use the app to scan products they are considering buying for a four week period. The app will display one type of label (decided at random) for each participant. The 'healthiness' of the foods purchased will be compared between the groups in the study to find out which types of labels are more helpful. Visit the STARLIGHT website to find out more. The FoodSwitch app offers great potential as a learning and teaching tool for use in schools. Using the app, students can explore food choices, and factors that influence these. By using the stories of the NIHI research team, teachers can facilitate learning that investigates the process of scientific research and the culture of the communities that carry out scientific research. As data is published from the STARLIGHT study, we will make this accessible to schools so that students can explore the findings for themselves. By using a real research tool, students will be able to engage in the process of research if they design and carry out their own investigations. We are looking forward to hearing about investigations that students design and carry out using the FoodSwitch app. Learning and teaching resources that make use of FoodSwitch are available here. These resources are linked to the LENScience Healthy Start to Life Education for Adolscents Project where full learning modules exploring issues relating to the non-communicable disease epidemic can be found. To download the free app for android or apple devices, visit the FoodSwitch website.